What size hats does the Hat Retainer fit? The Hat Retainer fits hats sized 6-3/4 to 7-3/8. 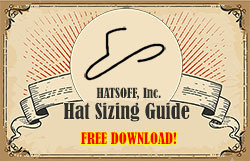 Please see our free Hat Sizing Guide for more details. What shape is the Hat Retainer? The Hat Retainer is a modified oval (between a round and long oval). What type of hats does the Hat Retainer work in? What is the Hat Retainer made of? The Hat Retainer is made of recycled durable polycarbonate plastic. Where is the Hat Retainer manufactured? The Hat Retainer is proudly Made in the USA! Where can I buy the Hat Retainer? 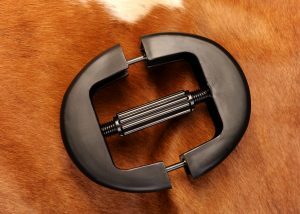 You can purchase the Hat Retainer at your local hat shop, western wear store, or right here on our website! How can I sell the Hat Retainer in my retail store? Contact Hatsoff, Inc. by using our contact form, email us direct at hatsoffsales@hatsoff.com or call 800-779-1137.